OK, is it a Sony MacBook or an Apple VAIO? 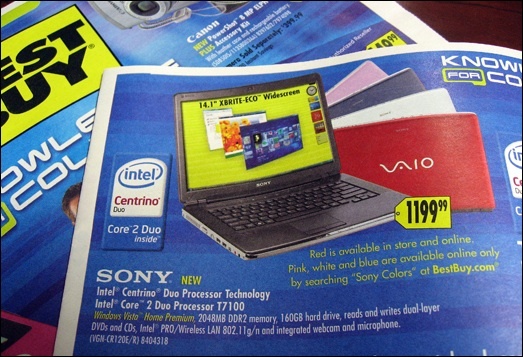 OPINION (7.11.07)-- Yesterday, we brought you a commentary on how the "CR Series" of Sony's VAIO laptops bore an uncanny resemblance--if not an exact clone--to Apple's black MacBook line. It was timely because one, the laptop that caught our attention is on sale this week at Best Buy stores, and second, AppleInsider.com reports that the new iMac revision will also bring with it a new Apple keyboard... a low-profile style like that found on the MacBook. So last night, we embarked on a little journey to see for ourselves whether the keyboard on Sony's VAIO laptop was a clone of Apple's MacBook notebook. The results were jaw-dropping. AD: Are you looking to buy a new or refurbished Mac notebook? Look no further than to MacPrices for the latest deals on both. Or, want to get rid of your old notebook (or even buy a second-hand one to save more money)? Try out the PB|Central.com Classifieds, a refreshing alternative to the other place called eBay. Not content with leaving you readers to form your own opinion without having a solid one of my own, I had to go out and touch, see, and compare the keyboards-- even though the links I provided in yesterday's article serve that purpose many times over. From the images directly from Sony's site, to the image views from Best Buy's product page on the particular laptop. I also mentioned that there's a picture of it in this week's Sunday ad insert, but that isn't available to everyone, plus the "weekly ad" link online changes every week (of course) leaving that bit of proof to disappear eventually. So to keep it etched in stone? I've included my own photograph of that ad for your viewing pleasure below. Before going to Best Buy however, I decided to stop by CompUSA (which is just at the other end) to see what "yellow tag" clearance deals they had this week. Since the offending Sony VAIO was also there, I took some photos just in case I didn't make it to Best Buy before closing time. And that's where the fun began! Right at first glance, there was no mistaking that keyboard characteristic of the MacBooks. (Remember, the non-Pro version). The one people complained about at first. Then gradually, came to love and accept as being even better than any Apple notebook keyboard ever made. (I don't use a MacBook daily, so I can't say yay or neigh). I couldn't help but stand there in disgust and utter amazement. If I didn't know better, I would have said I was staring at a Mac! If not for the VAIO logo imprinted on the laptop just below the keyboard, and the stickers advertising Windows Vista--that would have been the other fake out... Microsoft's adaptation of Mac OS X--plus the Sony logo on the bottom of the LCD screen. Stopping by to CompUSA first ended up being a good decision because their displays were more photo-friendly than those at Best Buy. (Don't ask. Just trust me on that one). Had I taken my photos at Best Buy, you wouldn't get to do your own virtual investigation on the next page. So, without further ado, turn the page and see if you think Sony took a page straight out of Apple's book... in this case, a MacBook! (Then drop us a line and share your thoughts with us).